Richard Cypher is brooding over the murder of his father in the woods surrounding his house when he glimpses a woman blazing quite the trail behind her. Intrigued, Richard starts following her. What he finds is an unexpected ambush meant to catch the lovely women, Kahlan, unaware. On instinct Richard feels it is his duty to save her from the ambush and protect her. There is no denying the confidence radiating from Kahlan. Though she is beautiful, Richard recognizes she is much more than just that. He is drawn to her strength…she is mesmerizing. He would love nothing move than to save her and ride off into the sunset somewhere with her….but she is clearly a woman on a mission. Kahlan has been send through the Boundary back to Westland in search of an exiled wizard rumored to be hiding in Westland. After rescuing her, Richard agrees to help her find the wizard and take her back safely through the Boundary but they are going to need help….the only person Richard trusts to protect Kahlan would be his life long friend and mentor Zedd. Zedd turns out to be the wizard Kahlan has come to find. After regaling Zedd and Richard with the horrors happening in the Midlands, both Richard and Zedd decide to join forces with Kahlan and stop the evil Darken Rahl from gaining power over the territories. After years of training, unbeknownst to Richard, Zedd finally admits he was actually ‘training’ him to be the Seeker. Richard is now able to command the Sword of Truth. With Richard being the new Seeker, Kahlan (Mother Confessor), and the last wizard set off on an epic tale of magic, adventure, prophecy, good, evil, and legend. Only the Seeker can bring balance and peace to the lands….if only he knew how. Richard must seek the solution. I have only recently gotten into the high fantasy genre when I started reading the A Song of Ice and Fire series this year. I decided to take a break from Westeros and explore other high fantasy series. A friend of mine recommended Wizard’s First Rule to me. I love fantasy books that are hero’s quest-centric and this sounded like it fit the bill. 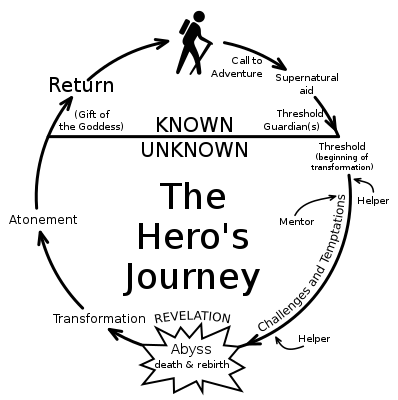 The well-known fantasy formula is pretty simple–a young hero receives his calling for a quest, meets a mentor (usually a wise wizard), a prophecy is foretold of an ancient destiny to fulfill, he goes through a series of challenges and an inner struggle with his identity, has a revelation accepting his fate, and then goes through an transformation and atonement period, finally ending with his return. Fantasy’s quintessential trademark though is the battle between good and evil. This series has all of that, to be sure. One of the things that I liked best about the ASOIAF series is the ambiguity of the characters….are they good or are they bad? Are they redeemable or not? But I know ASOIAF kind of changed the rules for fantasy lit, which is why I really wanted to read a more traditional high fantasy series. 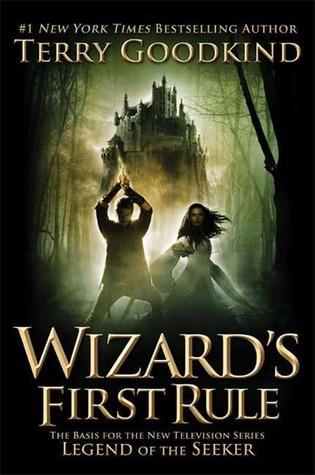 I really like reading a character driven novel and Wizard’s First Rule is that….but in an unexpected way. Richard is everything that makes a hero great: honorable, above reproach, brave, and self sacrificing. But every hero needs a weakness…Richard’s is his anger. He has a hard time controlling his anger, or at the very least, figuring out how to use it. For me, Richard was a little too perfect. I didn’t feel his inner struggle as I have with other fantasy heros. Goodkind takes his character right to the edge but it seems like he holds back with Richard…I think he could have taken him a little further in the story which may have made the reader feel his inner conflict more. The inner conflict and the choice to become the hero is what the heros quest is all about. I felt like Richard just accepted what he was supposed to do without question…this made the transformation/atonement part of the hero’s quest a bit wanting. While I enjoyed Richard, Kahlan was the character who stood out for me. I am really interested in women in fantasy lit so immediately I was excited to find out more about her. I loved that she wasn’t just a pretty face and I loved that Richard recognized how unique and special she was.She was confident, strong, and brave but at the same time she struggles with her identity as Mother Confessor. All her life she has been alone and afraid of what she is. I thought Goodkind did a great job with Kahlan’s inner struggle and growth in the story. I really felt Kahlan’s loneliness and need to love someone who was her ‘equal’.Richard had his heroics thrust on him but he still chose to fulfill his destiny, while Kahlan was born a Confessor and has no choice but to continue on in solidarity. The only other thing I struggled with while reading this book was the language. Goodkind’s prose is thick and wordy which makes the story drag in places. Sometimes things were repeated over and over again which I thought was unnecessary at times. There were a few too many adventures for me, I would have liked to have seen the Mud People adventure be where the story ended and then the next book pick up from there. High fantasy can be a tricky genre, there is always a lot going on for the reader to figure out…..operating in an alternative world/realm, spells, sorcery, magic, and prophecy are all complicated things, and I thought there was a little too much going on to fully appreciate and understand the important plot points of the novel. This is one of those books that I would probably need to read again to make sure I grasped everything. Overall I liked the novel. For someone just getting into fantasy (particularly high fantasy) this is a great introduction. I enjoyed the characters and the journey into a rich world full of magic, adventure, romance, and excitement. Richard is a solid hero who will be fun to see develop in future books of the series. Other than some of the cliches and lengthy prose, there is much to cherish and enjoy in this type of novel.